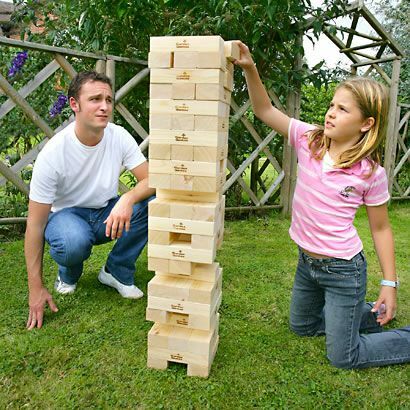 Jenga has been around since the 1970s and has provided hours of fun for kids and grown-ups across many different countries. Over time, people got creative and decided to put their own versions of the game out on the market. One of the most famous spins to the game is Giant Jenga. This is a great solution for making sure you keep all guests entertained during your party. For sure, your event will be remembered fondly even after the festivities are over. Plus, you’ll cater to the “friendly” and competitive side of your friends. “Jenga” means “build” in Swahili, which is the point of the game. You compete against another player while trying to stack blocks higher and higher. It sounds easy enough, but the twist is that you need to get blocks from the existing tower. This can be challenging if you aren’t careful with retrieving blocks, or if you have shaky hands. The person who causes the structure to fall or collapse loses. An entire family can play it, with each member taking turns. Now, Giant Jenga is even more fun, more challenging, and more immersive. You can find yourselves playing it over and over until you get a better hang of it. It’s perfect for all occasions - birthdays, weddings, corporate vacations, weekends, and more. In fact, you can even play it even if there’s no cause for celebration. The entire family and your friends will love it. Simply watching the game from the benches as it is played by others is already a lot of fun - so you can just imagine how exciting it is to participate in a round or two! Having this game eliminates any cause for concern for safety or boredom. You can be sure that your guests are having a great time, and your party will be one to remember. Plus, it is suitable for all ages. We make sure that all our games are 100% safe, even for kids. If you want, you can even host Giant Jenga tournaments against other families. It’ll be a great fun experience for everyone. The best part is that you don’t have to worry about a thing. Just point us where to place the game, and you’re all set. We’ll handle delivery and pick-up, too. Just sit back, relax, and enjoy your party! You can hire the game for the whole day, for just £15. You can hire it as a part of our promo with one bouncy castle. Alternatively, you can order three individual games (minimum) if you don’t want a bouncy castle. For more information, contact us by phone or email. We also have a FAQ page that may answer your questions. For more concerns, drop by our Contact Us page. Our customer representatives will happily assist you further. We have everything you can possibly need for any type of party. Games, courses, sumo suits, bouncy castles - you name it, we’ve got it. For all your event requirements, think of us - we can’t wait to meet you!